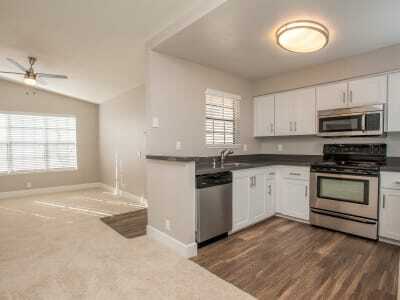 Slate Creek Apartments offers one, two, and three bedroom apartments. Not seeing what you're looking for? Availability changes every day. If you tell us what your needs are we’ll call you when availability changes. Regardless of which floor plan you choose, your recently renovated Slate Creek Apartments home provides the features you need to live life in style. Every one of our Roseville, California, apartment homes includes a washer and dryer, easy-to-clean custom white cabinetry, and a high-end refrigerator, making everyday cleaning and meal prep a breeze. You’ll love evenings eating alfresco on your private balcony or patio and relaxing with a good book in your oversized living room. Additional options like quartz countertops, a cozy fireplace, and walk-in closets give your home a sophisticated touch. Want to see our Roseville, California, homes up close and in person? Contact our friendly leasing team today to schedule your tour today.